Shamar Rinpoche flees together with the 16th Karmapa and other Tulkus (Jigme Rinpoche) via Buthan to Rumtek, Sikkim. The 14th Shamarpa Mipham Chokyi Lodro is the second highest teacher of the Karma Kagyu lineage and therefore a lineage holder. He was born in 1952 in Derge, eastern Tibet and was recognized by the 16th Karmapa Rangdjung Rigpe Dordje as the 14th rebirth of Shamarpa. In keeping with the tradition of the Karma Kagyu School, Chokyi Lodro received all the Karma Kagyu teachings from the 16th Karmapa Rangjung Rigpe Dorje. At his request, Shamar Rinpoche had the Institute for Buddhist Studies in New Delhi completed in 1981. In accordance with the wishes of the 16th Karmapa, this institute, the Karmapa International Buddhist Institute (KIBI), serves as a place where studies are conducted to promote universal wisdom and compassion. In 1996, Kuenzig Shamar Rinpoche initiated the worldwide network of Bodhi Path Centres, which are oriented towards the teachings of Atisha, which are attributed to Mahayana. In 2008, Shamar Rinpoche visited the Dharma Center Möhra. His worldwide activities also include the foundation of the Shar Minub Retreat Center in Kathmandu and the foundation of the Infinite Compassion Foundation. 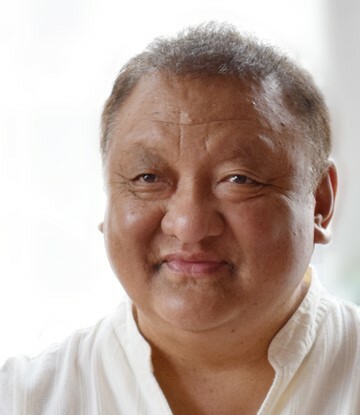 Shamar Rinpoche died on the morning of June 11,2014 at the age of 61 in the Bodhi Path-Zentrum Renchen. After his death, he was laid out for a few days in Renchen, where thousands of Western Buddhists bid him farewell. His main disciple, the 17th Karmapa Thaye Dorje, personally transferred Shamar Rinpoche’s body to India on June 19,2014. After further stays in New Delhi, Kalimpong and Bhutan the cremation ceremonies took place in Kathmandu on 31 July 2014. The ceremonies were conducted by the 17th Gylawa Karmapa Thaye Dorje in the presence of line holders from other schools. The reincarnation line of the Shamarpas dates back to the 13th century. The first Shamar Rinpoche, Khedrub Tragpe Senge (1283-1349), was the main disciple of the third Karmapa, Rangdjung Dordje. His second incarnation, Katscho Wangpo, received the Red Crown from the fourth Karmapa Rolpe Dordje, an exact replica of his own Black Crown. This should be the symbol of their inseparability. With the red crown Karmapa gave him the name Shamarpa – the one with the Red Crown. The Shamarpas have been incarnated since the 14th century as students or teachers of the Karmapas.